The Mechitarist Order is a Armenian-Catholic order that came to Vienna in the early 19th century from Venice. They occupy a rather peculiar-looking church with a strange façade in a very central area of Neustiftgasse in the eighth district (Josefstadt). The church is historicist, but incorporates a previously existing building; for a historicist church, I find it confusing since I recognise only few elements that I consider a reference to a certain era (eg. some elements that recall the Italian Renaissance). To make the whole thing even weirder, the Mechitaristenkirche is used by Christians of the Armenian community in Vienna, who have added their own religious symbols and decorations to the interiors. A few words on the history of the Mechitaristenkirche: The site of today′s church was previously occupied by a Franciscan church from around 1600, which was destroyed in the course of the Second Turkish Siege in Vienna in 1683. Only one year later, Count of Serenyi re-built the church. 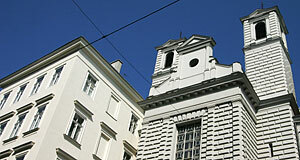 In the early 19th century, the Mechitarists moved to Vienna. They opened a print and publishing company next to the Franciscan church and used the church. In 1835, the Franciscan church burnt down completely. For the construction of a new church, the Mechitarists hired one of the most famous architects of Vienna of their days: Josef Kornhäusel, who had become famous as the architect of theatres - such as the nearby Theater in der Josefstadt. For more works by him, see the articles on the Kornhäuselturm and the Stadttempel Synagogue. Due to financial issues, the construction of the Kornhäusel design failed for a few decades - when the church was finally built, a new architect called Fritz Sitte altered the designs strongly. He and later his son Camillo Sitte built the church until 1874: Two towers and a detailed, patterned façade were meant to recall the early Italian renaissance. Something that I just can′t see, sorry. The original 19th century parts of the interiors are particularly elaborate; the Mechitarists got famous Ringstraßen-architects to contribute to them, most importantly Theophil von Hansen and Heinrich Ferstel. Frescoes were added for the 200th anniversary of the Mechitarist Order and in 1960, a mosaic was designed for the entrance area of the sacristy. So, I blame the turbulent past of the church for its rather confusing appearance. The Mechitarists, by the way, are still in Vienna and their claim to fame is something not dissimilar from Martini: A herb liquor called "Mechitharine". It contains 43 herbs and 12 fruits - the precise ingredients and recipe is a secret and known by only two monks at a time. The Mechitharine is still produced today and sold by the monks. Personally, I have never come across the stuff, but I have made only the best experiences trying alcoholic beverages produced by monks elsewhere - be it beers, wines or liquors. Attractions nearby the Mechitaristenkirche include two other churches, the Piaristenkirche and the Kirche St. Ulrich; the Spittelberg area, the Museumsquartier, the Volkstheater and Justizpalast; Palais Trautson and Palais Auersperg; the Houses of Parliament and the Naturhistorisches and Kunsthistorisches Museum.